The MMMIS is already entering its 3rd year! Only 3 years old, but already mature! Now more than ever, the Montreal Musician and Musical Instrument Show, presented by General Motors of Canada, is passionately dedicated to promoting music making in its quest to bring music within everyone’s reach! Still free, still open to all, the MMMIS serves as a unique gathering place where all people involved in music are represented: musicians, manufacturers, music lovers, craftsmen, amateurs and big-name professionals, in other words, all those for whom music and musical instruments are a passion. Just ask anyone who has already attended: it doesn’t take long and you’re hooked! And it’s obvious why: right in the middle of the Festival International de Jazz de Montréal, you have this incredible opportunity to feast your eyes on a vast line-up of musical instruments and accessories showcased by dozens and dozens of exhibitors, the opportunity to see, touch and hear the best that the music community has to offer, and to attend workshops and get-togethers with renowned artists, as well as free concerts: nothing less than a four-day musical immersion! Thanks to the increased involvement of General Motors of Canada, the MMMIS now has even more to offer! In fact, it has downright doubled certain features! For example, the number of interactive activities has soared from 70 to nearly 150! Better still, many of these activities, because they take place under the MMMIS GM Tent directly on the Festival site, will run over 11 days instead of just 4, that is, for the entire duration of the Festival! Never has the experience of learning about or making music been more fun! Hugely successful from the very first edition, the exclusive workshops and talks in the Rencontres series are back, this time with music stars such as John Abercrombie, Randy Bachman, Alain Caron, Bill Frisell and Russell Malone. It’s virtually impossible to meet your favourite stars in a more intimate setting! You can’t miss this! 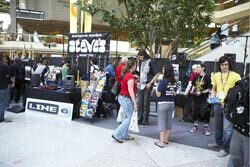 The MMMIS is experiencing another growth spurt, this time with its launch of a brand-new component: the Montreal Guitar Show. Given the resounding success of last year’s luthier component of the MMMIS, it seemed perfectly relevant, indeed essential, to create—with the MMMIS and Festival team—this first show devoted exclusively to lutherie guitars. 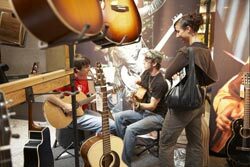 Unique in Canada, the MGS is the perfect venue for exhibiting instruments created by the top guitar luthiers (classical, acoustic, manouche, and archtop)…. and better still, they’re all up for sale! There for the taking are masterpieces by some 70 luthiers from Quebec, the rest of Canada, the United States, South America and Europe. The MGS will also host a multitude of activities, like guitar classes or free mini-concerts given by the big names in guitar and lutherie circles. 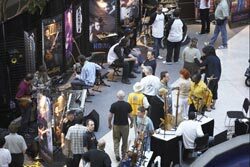 The Montreal Guitar Show will be held at the Hyatt Regency Montréal, July 6 to 8, from 11:00 a.m. to 6:00 p.m. The MMMIS is innovating again by presenting not one but two series of free guitar concerts! The first, Guitare Guitare, which already won fans last year, will be presenting Brooke Miller, the Ritari Ensemble, the California Guitar Trio and the Lionel Loueke Trio, at Salon Jeanne-Mance in the Hyatt Regency Montreal. 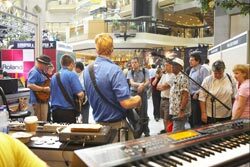 As for the all-new, aptly-named Guitarissimo series, it will be held under the MMMIS GM Tent where it will feature talented guitarists like David Gogo, Jorge Martinez, John Campbelljohn, Erik Mongrain, Mimi Fox, Jim Weider, Don Ross, Thomas Carbou, Ray Bonneville, Denis Chang and Del Vezeau. Nothing less than sheer guitar glory! I consider it extremely important to underscore the passion that revolutionizes the world of music from time to time. With this in mind, together with the Festival, we created the Tribute Award, which honours the outstanding contribution made by specific individuals to promoting music making. In the first year of the MMMIS, the award went to Jim Marshall, whose amps are renowned the world over. Last year, it was the turn of Robert Godin, creator of the famous guitars of the same name. This year… surprise! The MMMIS auction is also back! It gives you a chance to lay your hand on accessories, instruments autographed by artists, and the famous, unique and superb Godin guitars redrawn, coloured and at times, even sculpted by Yves Archambault, the Festival’s artist in residence. All proceeds from the silent auction will go to the MMMIS’s Music-to-Youth Fund, which helps finance the MMMIS, a non-profit organization, specifically to help maintain and develop its youth activities such as the Blues Camp. Yes indeed, the famous Blues Camp! The MMMIS and the Festival offer 55 youngsters from the ages of 13 to 17 the chance to improve their musical knowledge and give free rein to their passion for a whole seven days! And believe me, from what I saw last year, I’m not exaggerating when I say passion! And talent! You’ll be able to judge for yourself at the wind-up show they will be giving on July 8, at 7:00 p.m., on the TD Canada Trust stage. From July 2 to 8, the second edition of the Blues Camp, presented by TD Canada Trust Musique, will be held at the Cégep du Vieux Montréal, right near the Festival site. The MMMIS is honoured to be able to count on the generous support of the MIAC (Music Industries Association of Canada/Association Canadienne des Industries de la Musique), which assists the MMMIS in its mission of promoting music making. Many thanks to Al Kowalenko, MIAC’s executive director, and to Gerry Labelle, his representative in Québec, for their confidence and wise advice! As always, the MMMIS wishes to thank its sponsors—General Motors of Canada, Godin Guitars, Archambault, Marshall, Steve’s Music Store, Roland Canada and XM Radio Satellite. Thanks also to our partners from the public sector (the Government of Canada, more specifically, Economic Development Canada, the Government of Québec, particularly the Ministère des Affaires municipales et des Régions) and the media (Couleur Jazz 91.9, MusiquePlus, MusiMax, CIBL 101.5 FM, CKUT 90.3 FM, the Voir and Hour, as well as Complexe Desjardins and the Hyatt Regency Montréal for their warm welcome. And last but not least, thanks to our partners and all our exhibitors. 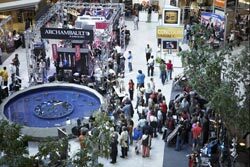 II’ll be waiting for you at Complexe Desjardins, from Thursday, July 5, to Sunday, July 8, from Noon to 9:00 p.m., for this 3rd edition of the MMMIS!